Environmental/industrial exposure to heavy metals, light hydrocarbons, pesticides and siliconcontaining compounds all have been associated with the development and/or progression of renal failure. Exposure to heavy metals, more particularly lead, cadmium and mercury has been linked with the development of acute or chronic renal failure. 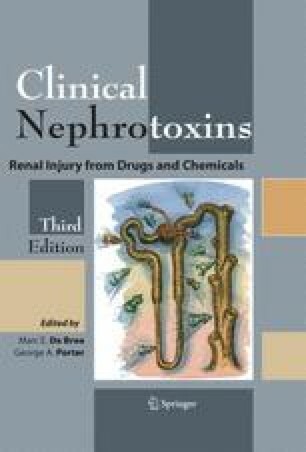 The current literature also contains a growing body of information linking solvent exposure with renal injury. To what extent exposure to environmental/occupational contaminants such as pesticides play either a causal or contributive role in the development of chronic renal failure is less clear. Reported observations suggest either a primary or secondary role of silicon-containing compounds in the development of anti-neutrophil cytoplasmic antibody-positive rapidly progressive glomerulonephritis and Wegener’s granulomatosis. Such observations deserve further confirmation as do studies suggesting a particular sensitivity of the diabetic kidney for the damaging effects of certain occupational exposures.